This Old House is New! This nearly 100-year-old Victorian house is ideally located with water views and walking distance from the beach in charming Stonington, Connecticut. We recently renovated the first and second floor while maintaining the house's original charm. 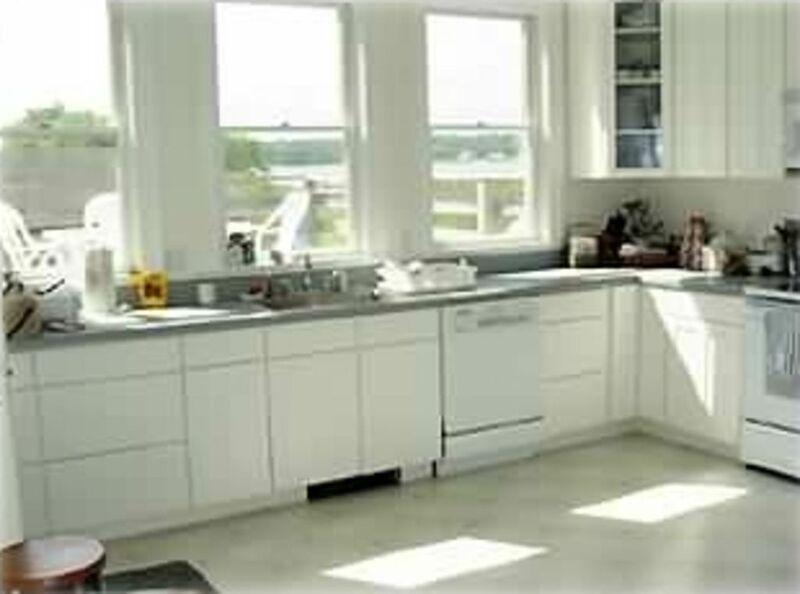 There is a large, efficient kitchen. In addition to six charming bedrooms on the second and third floors (king-size bed, three queen-size beds - one with a canopy, one full-size bed, and two twin beds), this house has a huge outdoor deck with a view of the beautiful sunsets over the water. A large yard provides the perfect setting for volleyball, croquet, and many other outdoor pursuits (sports supplies can be found in the garden shed or in the three-car garage). The master bathroom has a shower and a jetted tub, and there are two other full baths and a half bath. With the numerous bedrooms, great living space in and out of the house (living room, dining room, and huge kitchen), and its casual relaxed decor highlighted with beautifully restored antiques, this house is ideally suited for summer rentals, family reunions, wedding groups (no parties allowed), families coming to town for graduations, and holiday weekends. My mother bought this house in the early 90s and it has since been a home-base for our family. The picket fence and green shutters have seen wedding dinner rehearsals, post-baptism parties, and family reunions. My own kids have played for full summer days in the yard. My husband planted tree saplings 18 years ago that we have watched grow along with our daughters. It is a unique place and an important reminder that family time is special and should not be squandered. really big and nice house was perfect for our get together. everything worked and it was clean. only suggestion would be to pre-stock a few of the special trash bags, we were able to get some at a local grocery so it wasn't a big deal. Thank you for your kind words and so glad you had a good stay. Thank you also for noting the garbage bags, we usually have them stocked but I guess more had been used than we thought. We enjoyed our weekend stay in your wonderful home. The deck and yard are great and sunsets spectacular! Fortunately the weather was perfect. The house was immaculate and furnished with everything you could possibly need. Thank you so much for your nice review. Glad you enjoyed the deck and yard especially! Weather we can't control, but are always happy when it cooperates! Hope to have you visit again. We had a group of 9 women with plenty of room. Had a great time even though the weather wasn’t as sunny as hoped! The house is in a great location in walking distance of shops and restaurants. The deck is great (although we didn’t get to use it due to rain). Lots of bedrooms, nice big kitchen and we really appreciated the big table to play games on! Highly recommend this place! Thank you so much for your nice words. So glad you enjoyed the house - despite the rain. I wish we could control the weather! We had a great time with kids and grandparents here. Lots of bedrooms and bathrooms meant we had room to spread out, and the view from the back yard was great for watching the boats and trains. We hope to come back some time! Thanks so much for your kind words, and glad your extended family could all be together, and that you enjoyed your stay, and especially the view from the deck and yard! We spent a long weekend at this beautiful waterfront house and started relaxing the minute we arrived. The large deck overlooks the dunes leading to the Sound and was the perfect setting for a cookout while watching the sunset. Every room has charming attention to details and the living room was large enough for our group to sit for hours chatting comfortably. The owners couldn't have been more helpful or nicer. There are many area attractions we enjoyed as well- touring the Stonington lighthouse, a walking tour of town, nature preserve on the water and great restaurants. You can't go wrong with this house. It's totally lovely in every way. Thank you for your wonderful review. We hope you can visit Stonington again in the future.